On Crunchify we are using Genesis Framework and Eleven40 child theme. So far we have done numerous enhancements and added number of hooks. As I believe, child theme Eleven40 is missing one of the major functionality of Search Engine Optimization (SEO) goal and which is by default add Category Name and Description for each category page. NOTE: This tutorial will fix Bing Webmaster’s SEO error: <h1> tag missing error. Take a look at last point below. Also, it’s good user experience to show Category Title and Description for better readability and clarity. How to creating Dynamic Titles Based on Category and Tag archive? Having trouble getting genesis archive title? How to get get current category name in WordPress? NOTE: If you are NOT using Genesis Framework then go to step-3. This step is only for Genesis WordPress users. Add below code to your Genesis child theme’s functions.php file. NOTE: This is NON Genesis WordPress hook. For Genesis Framework User move to step-4. Now before you implement this in your non Genesis theme, make sure if you are missing this functionality or not :). If you already see Category Title and Description then you are all set. Replace above line with below lines to your theme. As there are thousands of WordPress themes out there in repository, you may need to modify code slightly as per your need. NOTE: Be careful before saving file and make sure there is no PHP error otherwise you may break your theme (White blank page on site error). And you should see Category Title wrapped inside H1 HTML tag followed by Description. Add below code to your theme’s style.css file to beautify Category Title and Description section. If you want to add title and description for all TAGs then just replace if ( is_category()) with if ( is_category() || is_tag()). How to display most recent comments on your WordPress blog with Gravatar? 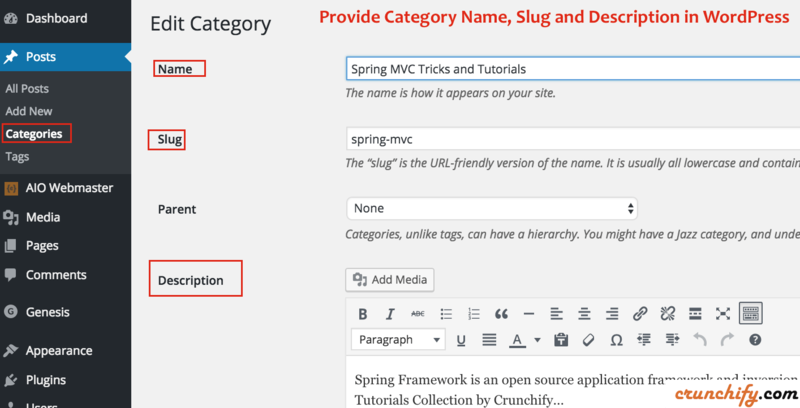 WordPress: How to Check if Category Has Children? How to fix Spring MVC MailSender and SimpleMailMessage import missing Error?